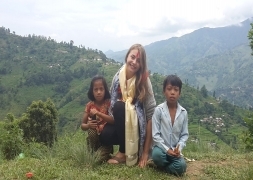 You want to experience the simple life and culture of the people in Nepal out of the hustle and bustle of Kathmandu, support them with their daily work or teach English at the village school? With this project you get the chance to be part of the village society in a beautiful location surrounded by green hills and rice fields in a small village in Sikre about 5 hours far from Kathmandu. You live together with your host family and get to know their daily life. The house was rebuilded after the earthquake and is not very big but feels very homely. You sleep together with the family in one room, the father sleeps in another room. There is a small toilet near the house and you can take shower outside in the river or under a pipe in swimming clothes. The living condition is very simple but it is great to get to know the life of the people there. 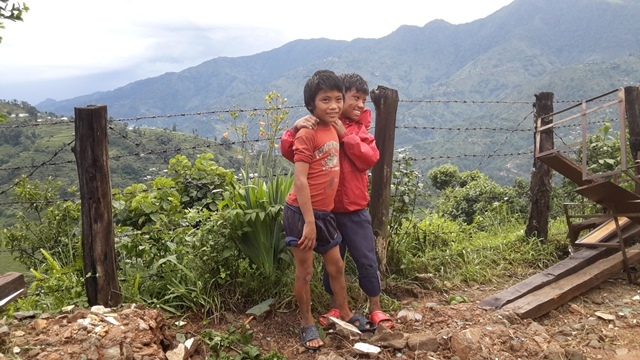 They don`t have TV or Wifi but are happy even without new technology. The village life is slow, you have time for yourself and you can sometimes just relax or go hiking in the area around the village and forget the stressful work in your home country. After the earthquake the school was destroyed. Right now we are building it new and we are planing to support the project even in the future. The people in Sikre can`t speak english and are not much educated. But education is the most important thing in Nepal. The people will be able to find a good job later and especially the girls are more confident and are able to handle their life alone. Sometimes this makes it possible for them to decide, that they don`t want to marry. Arranged marriages are very common in Nepal. In the school there are 5 classes. The first is the nursery. The children learn mostly by playing. Thereafter class 1 to 4. Even the teachers can speak only little bit english. You assist the teachers from 10 to 16 oclock and teach the children english. You can start with very simple things because most of them only know very few words in english. The pronounciation of the teachers is often very different than ours and there is a lack of speaking practice of the children. So you can start by presenting yourself and let them present themselves so that you can also find out about their English knowledge. And then – be creative.. If you want you can connect farming and teaching for example support the teacher at school for 3 hours and then help with the other parts of village life. You arrive in Kathmandu and are transferred to your new host family. Today is no programme, so you have time to rest and recover from the long flight. 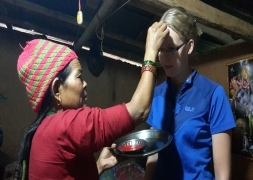 Today in the morning you have a yoga lesson and after breakfast language and culture class, You get to know something about the traditions in Nepal and learn little bit of the language, so that you are able to talk a few words in Nepali. Your family will be happy! After that you go for sightseeing in Swayambunath, the "Monkey Temple" of Kathmandu, a buddhist temple with a stupa. Then you go to Thamel a quarter in Kathmandu, where you can find innumberable shops, restaurants and cafes, where you can buy souvenirs or go out for eating. Today in the morning you will have again yoga and language class. After that you visit Pashupatinath, one of the most important and famous temple complexes for Hindus. At the riverbank of Bagmati, the believers burn their dead relatives and strew the ash in the river. After that you visit Bodnath, a buddhist stupa where the buddhists come and pray. Today after breakfeast you drive to Bhaktapur by local bus. Bhaktapur which is located in the east corner of the Kathmandu Valley is an ancient Newar city abought 8 miles far from the capital city Kathmandu. It was the largest of the three Newa kingdoms of the Kathmandu Valley, and the capital of Nepal during the great "Malla" Kingdom until the second half of the 15th century. It is famous for its rich culture, temples, and wood, metal and stone artworks. Because of this it is also listed as a World Heritage Site by UNESCO. In the afternoon you will visit the big Changunarayan Temple and then go back to your house. Today in the morning you have free time. If you want you can visit Thamel again or make a trip to Kirtipur, which is only about 30 minutes away, a small town from where you can see the mountains if the weather is good. In the afternoon about 16pm you will have a Momo cooking lesson. Momo is a traditional tibetan food. Today a guide picks you up and goes with you to your project. You have to drive on the whole about 10 hours today. If the road is bad or something else happens so that you get late, you take a hotel, stay there overnight and go the next day in your project. - Then you cut grass with the other people. The grass is carried in a big basket which they carry with a thick band around their forehead. - You have free time until 10. At 10 you should be at the school where they will sing the national anthem of Nepal at this time and after that go in their classes. School will finish at 16 pm. You assist the teachers. After school you will have again free time and in the evening between 18 and 19 pm eat dinner. If you want you can combine these 2 projects. You can teach for example until 13 pm and then go with the village people to the fields and support them there. Your program ends on a Friday and you will fly home on the following Saturday or Sunday. If you have any special wishes please don't hesitate to contact us. 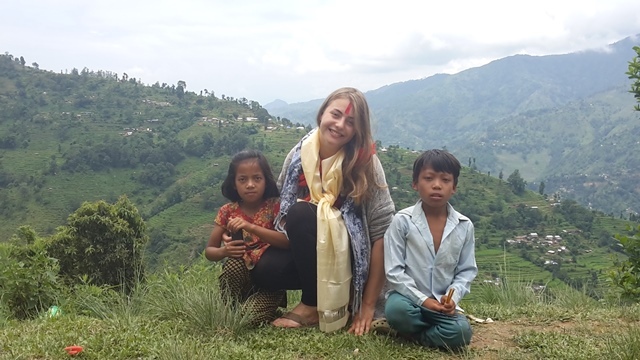 It is also possible to end your volunteering work with trekking or a roundtrip so that it is possible for you to get to know all regions of Nepal. Please book your trip at least 2 weeks before your preferred start date! By clicking on 'customize your trip' you can indicate an individual start and end date. The program starts on a Monday and ends on a Friday, so please choose a Monday for your start date. You should arrive in Nepal the Saturday or Sunday before. The program ends on a Friday, so please choose a Friday as end date and book your flight so that you fly back on the following Saturday or Sunday. Personal expenditure: e.g. drinks, souveniers, laundry, snacks, etc. - Proof your insurances: Do you have a valid travel- or health insurance for Nepal? Do you also need a luggage insurance? 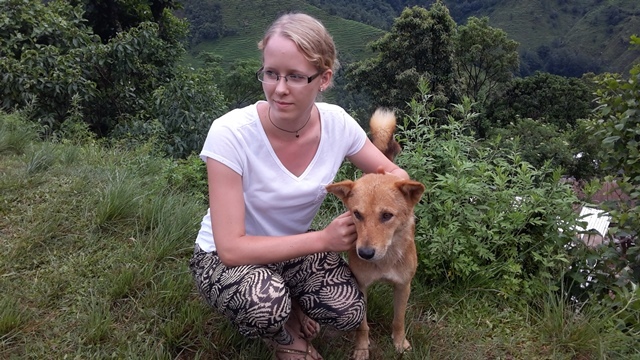 - check if you have to refresh imunisations or visit a travel medicine doctor and maybe take immunisations against rabies if you work with street dogs or take malaria prophylaxis if you stay longer in Chitwan. - check if you have a credit card like Visa or MasterCard with which you can get money from the ATMs in Nepal. There are also money changer everywhere where you can change euros or dollar in Nepali Rupees. You will be located in the district Nuwakot to the north of Kathmandu. There you will stay in a small, harmonic village where you can teach the children in the village school or help the people on the fields. If you want you can teach in the morning and help on the fields in the afternoon - as you wish. It is also possible to go trekking a few days to experience the nature fully and have great views of the Himalaya.